Obturator Nerve belongs to the adductor compartment of the thigh. The inside of psoas major from anterior sections of the ventral rami of L2 to L4 spinal nerves. The nerve goes down in psoas major and issues from its medial border at the ala of the sacrum. It runs through the upper anterior part of the obturator foramen to the medial (adductor) compartment of the thigh while descending along the lateral wall of the lesser pelvis on the obturator internus. It divides into anterior and posterior which stride the adductor brevis muscle, close to the obturator foramen. All muscles of the adductor compartment of thigh are supplied by its motor branches. Cutaneous area on the lower-half of the medial aspect of thigh are supplied by its sensory branches. Articular branches to the hip and knee joints are also supplied by it. While going through the obturator canal the obturator nerve divides into anterior and posterior sections. The anterior section also supplies an articular twig to the hip joint. 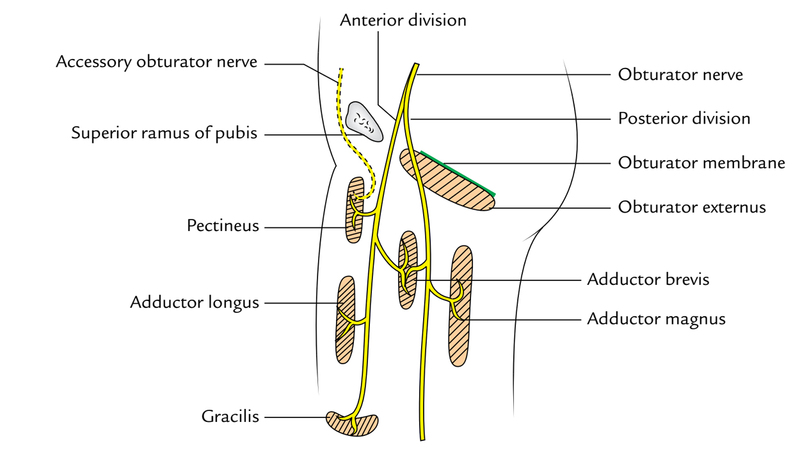 Distal to the adductor longus, it enters the adductor canal where it gives a twig to the subsartorial plexus of nerves and ends by supplying the femoral artery in the adductor canal. 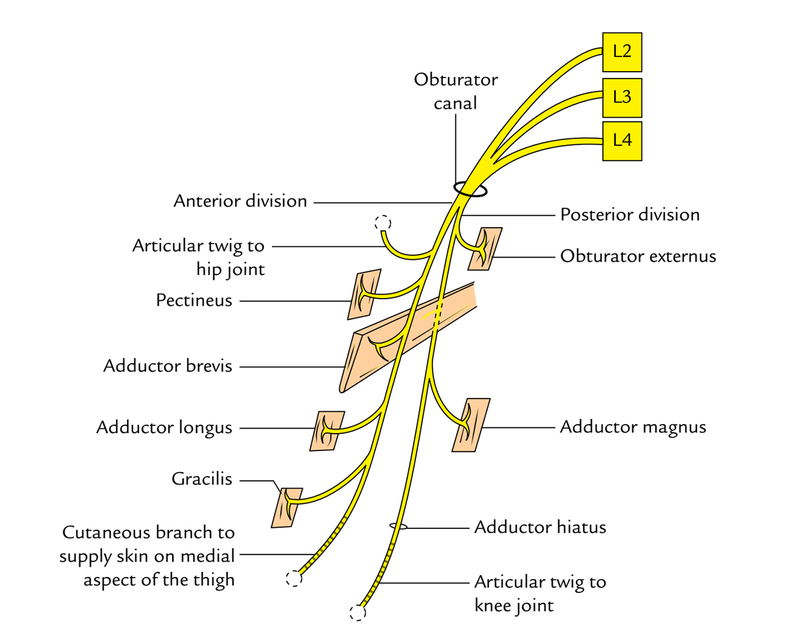 Its terminal part creates an articular branch termed genicular branch, which pierces the adductor magnus or goes through hiatus for femoral vessels to reach the popliteal fossa where it runs along the popliteal vessels and pierces the oblique popliteal ligament to supply the knee joint. Motor reduction: Decline of adduction of the thigh, because of paralysis of adductor muscles of the thigh. Sensory loss: Sensory loss on the medial aspect of the thigh, because of participation of the cutaneous branch of the anterior section of the obturator nerve. 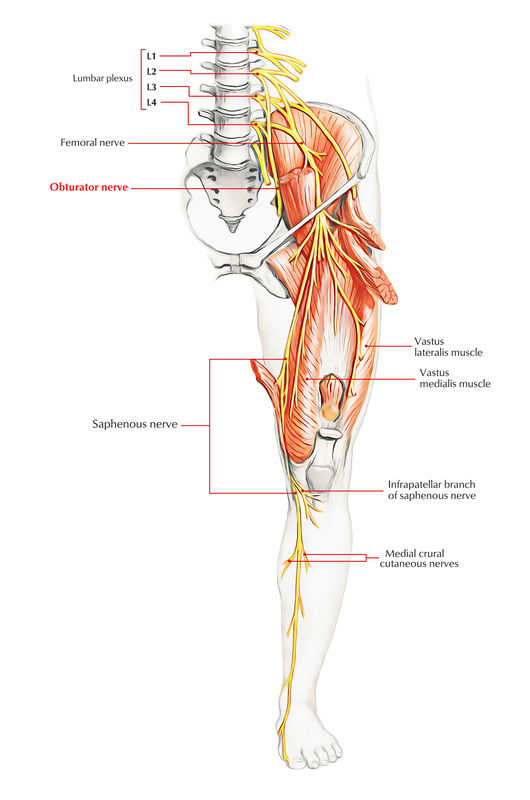 The syndrome of an obturator nerve entrapment causing the medial thigh pain is described in sportsmen with large adductor muscles. It’s sometimes carried out to alleviate the spasm of adductor muscles in the spastic paralysis. The inflammation of the ovary causes localised peritonitis in the region of ovarian fossa which might cause annoyance of the obturator nerve. In this case, the pain could possibly be referred to the hip, knee, and medial side of the thigh. In diseases of the hip joint, the pain could be referred to the medial side of the thigh. In about 30% people, accessory obturator nerve originates from the lumbar plexus. It’s created by the ventral sections of the anterior primary rami of L3, L4 spinal nerves. It crosses the superior ramus of pubis deep to pectineus, which it furnishes. It supplies an articular twig to the hip joint and ends by communicating with all the anterior section of the obturator nerve. If small, it supplies only the pectineus muscle.